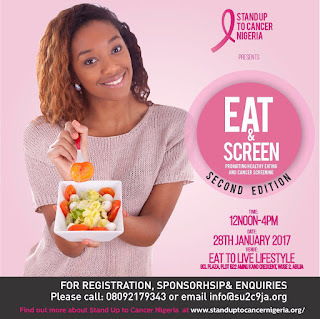 Abuja Events and Places (AEP): Eat And Screen, Abuja Is On This Saturday. Eat And Screen, Abuja Is On This Saturday. It's happening this Saturday the 28th of January 2017. "Eat and Screen Abuja". Come, eat healthy and get screened for free. cancer test for the first 50 women to come. Venue is Eat to Live Lifestyle, GCL plaza(beside 1st forty hotel) Wuse 2 Abuja. This event is organised by Stand Up To Cancer Nigeria. The event is sponsored by HOT FM, Swissgarde, Medicaid Radiology, Medicaid Cancer Foundation, Envy 365, SephicWorld, Kolimo Multimedia, Eat to Live Lifestyle, Hvee Entertainment, 3Js Hotel, Doigts Collants, Lead British International School, WE FM, @abujaeventsandplaces blog and Australian Aid.